The Tagus River is an important source of water for millions of people in Spain. The Tagus is the longest river that can be found in Spain. Photo credit: shutterstock.com. Spain is witnessing its worst drought of the past two decades. According to the Euro Weekly Newspaper, temperatures recorded during spring in Spain this year were 1.5 degrees Celsius above average. This, combined with relatively low precipitation levels, has led to the shrinking of Spain’s longest river, the Tagus. The river, which originates in the Aragon region, flows through Spain and Portugal and discharges into the Atlantic Ocean through an estuary near Lisbon. Scientists now believe that the river is facing a real threat of completely drying up. While the water levels are at their lowest levels in recent years, the issue is not a recent one as the primary cause of the decline of the river can be traced back to the early 20th century. 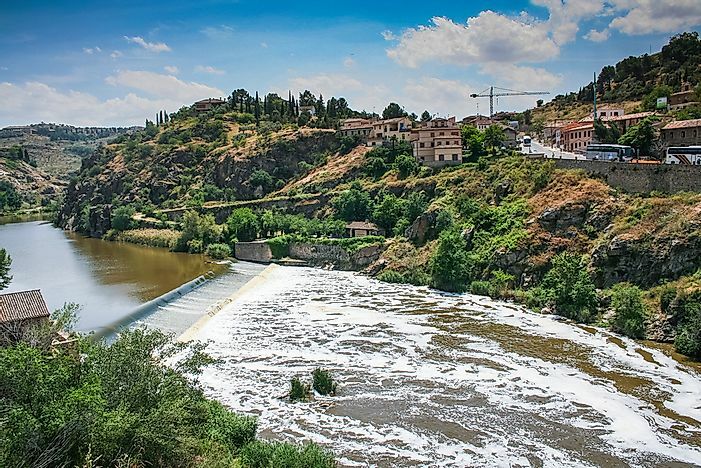 In 1902, water from the Tagus River was diverted to the Segura River for irrigation. In addition, 50% of the Tagus River’s water began to be siphoned to Segura River. The water from the river is also used in nuclear plants for cooling of the nuclear reactors, a process that consumes massive amounts of water. As if that did not put enough strain on the water resource, the Tagus River is dammed up to 51 times in Spain to create water reservoirs. The Tagus River is the most important water source for Spain’s reservoirs many of which are at record-low water capacity, some being as low as 49.6% of the capacity. The danger of the river shrinking in recent years is however not a problem exclusive to the Tagus River. Many other major rivers in the world are experiencing rapidly declining water levels caused by demand for water for hydroelectric energy production as well as irrigation. One of the world’s largest rivers, the Nile, is facing a real threat of shrinking by about 25% after one of the river’s main tributaries, the Blue Nile in Ethiopia, is about to be dammed in preparation for the construction of a mega hydroelectric power plant by the Ethiopian government. In India, uncontrolled irrigation systems have caused the frequent drying of the Cauvery River which affects thousands of farmers downstream with the drying of the river even being linked to increased suicides.